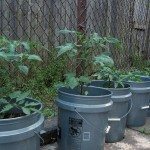 I was wondering if I covered plants with a 5 gallon bucket when it gets cold, would that be ok? As long as the plastic is not touching the plants this should be fine. YOu can also place water bottles of hot water under the bucket as well, to keep the air inside a little warmer overnight.